Purslane, also called Portulaca oleracea, is plants consider a weed in the United States and it is found in most gardens. Believed to have come from a desert in North Africa, it has aggravated gardeners around the world because it can be rather invasive. It spreads out before it gets taller, so it can cover quite a bit of ground. Also known as little hogweed, verdolaga, common purslane, portulaca, and pursley, purslane adds a somewhat tangy note to soups and stir-fries, and its juicy leaves can be used to add texture to salads. It is a wild-growing succulent plant is also completely edible, and it’s delicious, too. Apart from culinary facets, it is also an all-around healthy food which contains a whole range of health-boosting nutrients, like omega-3 fatty acids, antioxidant vitamins, and minerals. Cupcake Peachy Purslane, Pazzazz Deep Pink Purslane, Pazzazz Salmon Glow Purslane are few of the popular varieties of Purslane that is grown worldwide. Purslane is a green, leafy vegetable that can be eaten raw or cooked. It is a succulent annual trailing plant sized 40 centimeters (16 in) in height. It prefers comparatively less water and soil nutrients and grows well sunny climates and can thrive in all soil types. It is often found thriving in the cracks of sidewalks and driveways even during summer’s heat. It often pops up in container gardens, flowerbeds, gardens, fields, waste ground and roadside. Purslane plant has taproot with fibrous secondary roots and is able to tolerate poor compacted soils and drought and fleshy or watery, smooth, reddish-green to purplish-red stem repeatedly branched and often forming circular mats 30-60 cm (1-2 ft) in diameter or larger. Leaves are small, oblong, wedge shaped and dark green colored. Flowers are small, yellow, solitary or clustered, stalk less, placed above the last leaves on the branches and are up to 6 millimeters (0.24 in) wide and are found blooming during June and July. Flowers later produce small green, egg or a pear-shaped seed capsule that consists of nearly oval seeds that are wrinkled, and black with a whitish scar at one end. Purslane is best known as an invasive weed and is wild-growing succulent plant, completely edible, and it’s delicious, too. This succulent plant contains about 93% water. It has red stems and small, green leaves that are extremely delicious. Leaves are small, oblong, wedge shaped, thick and stalked, clustered together and are between 1/4 inch and 1 inch long, and 1/16 – 1/2 inch wide and are dark green colored. It has a slightly sour or salty taste, similar to spinach and watercress and add a slightly tangy note to soups and stir-fries, and its juicy leaves can be used to add texture to salads. It can be used in many of the same ways as spinach and lettuce, such as in salads or sandwiches. Apart from that Purslane leaves also consists of whole range of health-boosting nutrients, like omega-3 fatty acids, antioxidant vitamins, and minerals that are extremely essential for promoting our health. Purslane is an annual plant that is native to Persia, Africa and India. It grows from late spring until early fall. It was brought to Europe during 8th century by Arabs who used it as a salad herb. 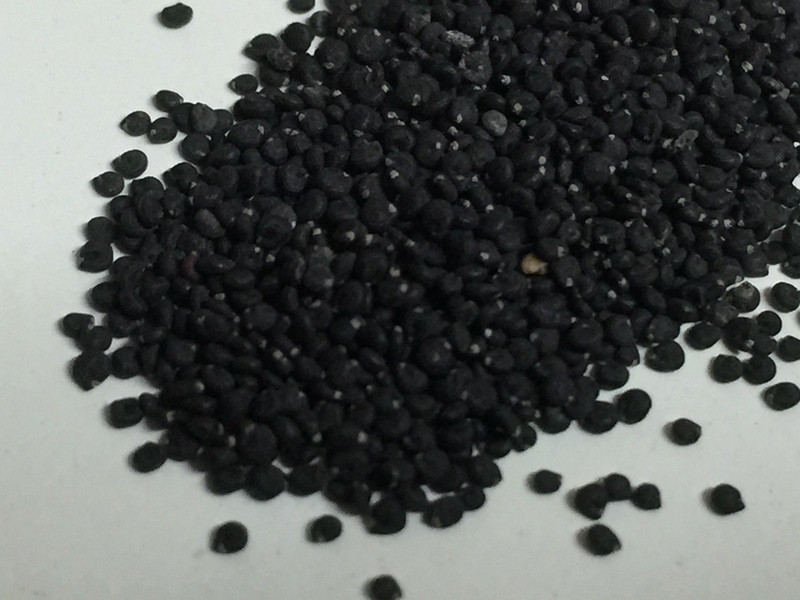 From Europe, the plant spread into the United States as well as Central and South America. Now it is most abundant in the eastern states, including Florida, and least common in the Pacific Northwest. It is grown throughout the world due to its health promoting nutrients, vitamins and minerals and due to its tangy and delightful taste. Apart from their slightly sour or salty taste purslane is a good source of nutrients, vitamins and minerals. Consuming 43 gram of purslane offers 0.86 mg of Iron,9 mg of Vitamin C, 29 mg of Magnesium,0.13 mg of Manganese,0.049 mg of Copper,212 mg of Potassium, 0.048 mg of Vitamin B2, 28 mg of Calcium and 19 mg of Phosphorus. Vitamin B2 present in purslane is a proven option for dealing with painful migraine headaches. Physicians normally recommend riboflavin in high doses of 400 mg. as a preventive treatment for headaches or as a cure for those who frequently experience serious migraine attacks. Supplementing with vitamin B2 rich food has been shown to be a natural headache remedy and to reduce the frequency of migraines, plus it may help decrease symptoms and pain during a migraine, as well as to shorten the duration. Purslane consists of Iron that plays an important role in speeding up the process of wound healing. It helps in the formation of RBCs, the most essential constituent of hemoglobin that transports oxygen around the body. Without the proper supply of oxygen wound healing cannot take place. 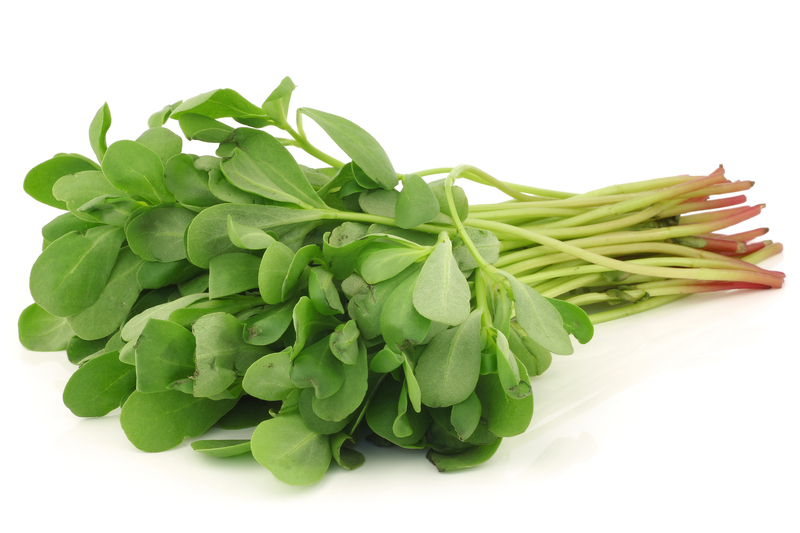 Purslane consists of 0.86 mg of iron which is 10.75% of the daily recommended value. Purslane is one of the best options widely used to treat everything from diarrhea and intestinal bleeding to hemorrhoids and dysentery. Although most of the western medicine does not confirm these findings, purslane is still used for a wide variety of intestinal conditions. These benefits are mainly attributed due to the presence of so many beneficial organic compounds found in purslane, like dopamine, malic acid, citric acid, alanine, glucose, and many others. Vitamin C protects our body from infections and maintains healthy bones and teeth. Apart from that it also improves our body’s ability to repair wounds and keeps us immune from bacteria, viruses and infection. It is also essential for collagen, the main structural protein found in connective tissue. Vitamin C, when taken orally, helps wounds heal faster and better. Applied topically, it protects the skin from free radical damage from the exposure to UV rays. 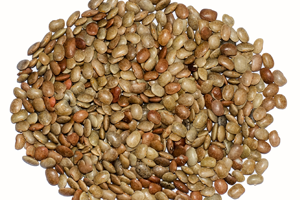 Purslane consists of copper that plays an important role in ensuring the proper function of the thyroid gland. However, excess copper is a major cause of thyroid malfunction, so you need a very balanced level of copper in the blood, or else hormonal activity will be imbalanced, and you can develop symptoms of either hypothyroidism or hyperthyroidism. Although it is considered a weed in the United States; it may be eaten as a leaf vegetable. 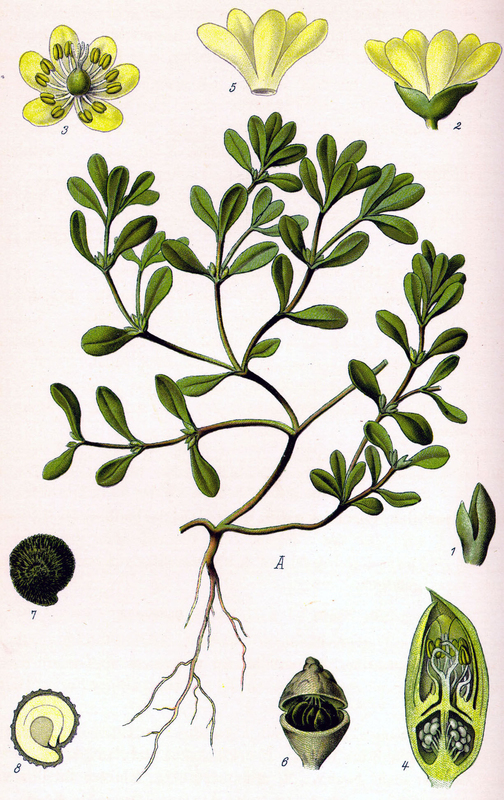 Purslane may be consumed fresh as a salad, stir-fried, or cooked as spinach is, and because of its mucilaginous quality it also is suitable for soups and stews. Greeks use the leaves and the stems with feta cheese, tomato, onion, garlic, oregano, and olive oil. Besides being used in salads and in baked pastries, it is cooked as a vegetable similar to spinach in turkey. It also is used as a vegetable similar to spinach, mostly simmered and served in olive oil dressing, or mixed with other ingredients as a filling for dough layers of byrek in Albania. It is used as a soup ingredient in the south of Portugal. It is cooked as in stews along with lentils, similarly to spinach, or in a mixed green stew in Pakistan. Young, raw leaves and stems are tender and are good in salads and sandwiches. 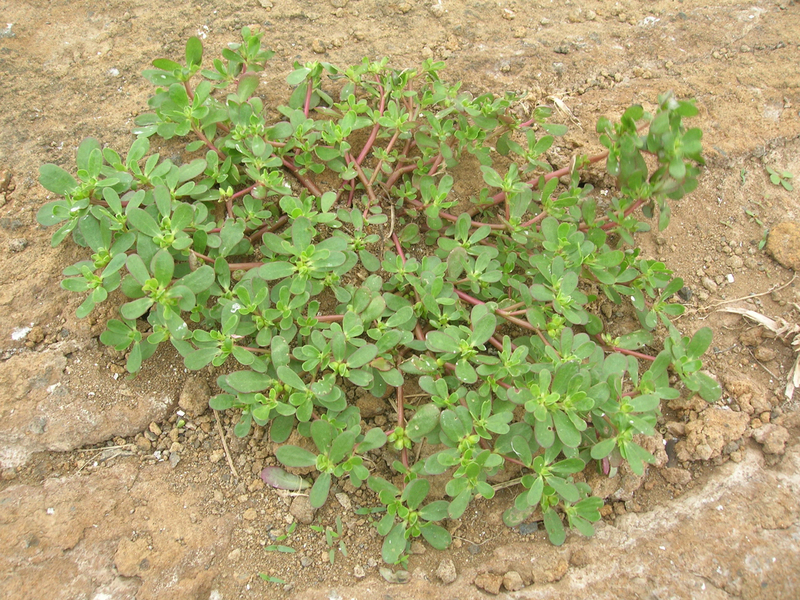 Purslane seeds are often used to make some herbal drinks. Sautéed and gently stewed stems and leaves served as a side dish with fish and poultry. It has also been used in soup and curry preparations and eaten with rice and ragi cake. Its leaves are used for insect or snake bites on the skin, boils, sores, pain from bee stings, diarrhea, bacillary dysentery, postpartum bleeding, hemorrhoids, and intestinal bleeding. 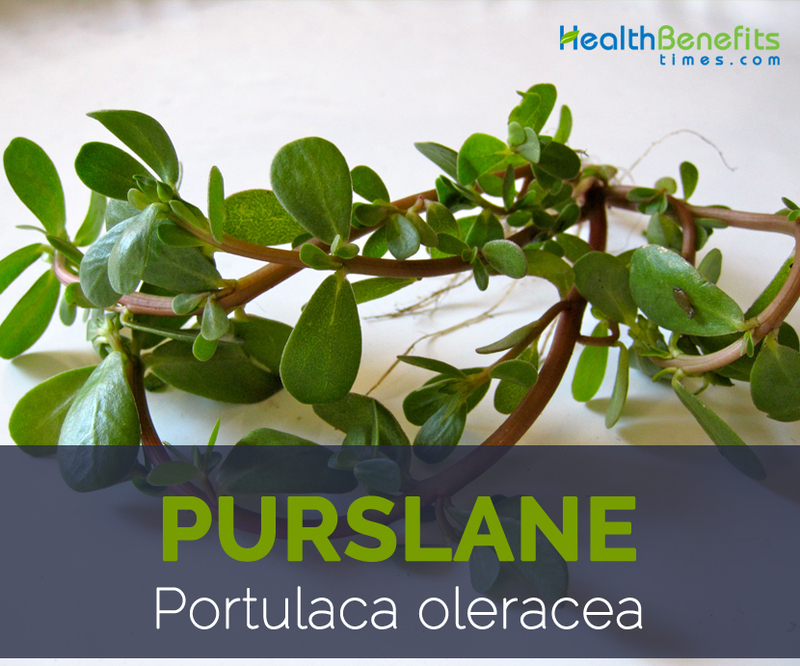 Purslane is an effective treatment for oral lichen planus. Expressed juice, taken while fresh, was said to be good for strangury, and taken with sugar and honey to afford relief for dry coughs, shortness of breath and immoderate thirst, as well as for external application in inflammation and sores. The herb bruised and applied to the forehead and temple, was said to calm excessive heat, and applied to the eyes to remove inflammation. The herb if placed under the tongue assuayeth thirst. The juice, with oil of Roses, was recommended for sore mouths and swollen gums and also to fasten loose teeth. The seeds, bruised and boiled in wine, were given to children as a vermifuge. 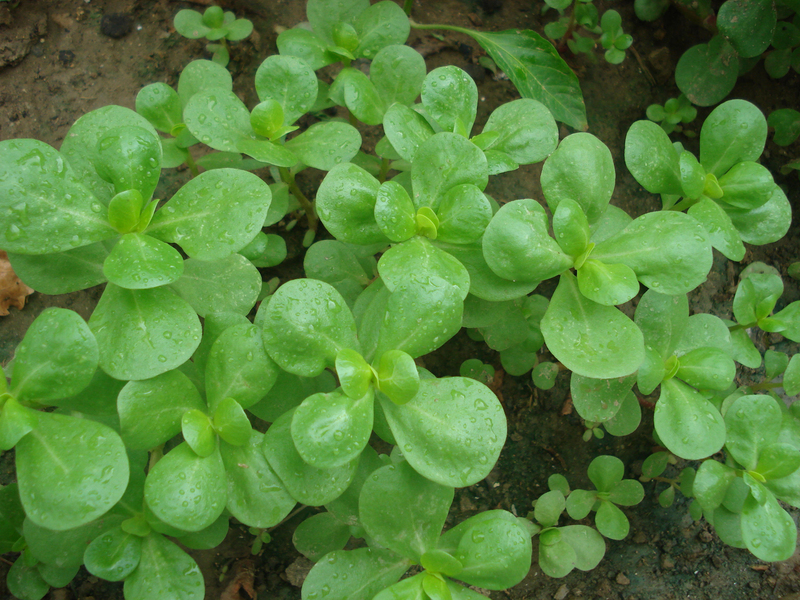 Purslane has been used to feed sheep and pigs. Purslane contains oxalic acid, a naturally-occurring substance found in some vegetables, which may crystallize as oxalate stones in the urinary tract in some people. 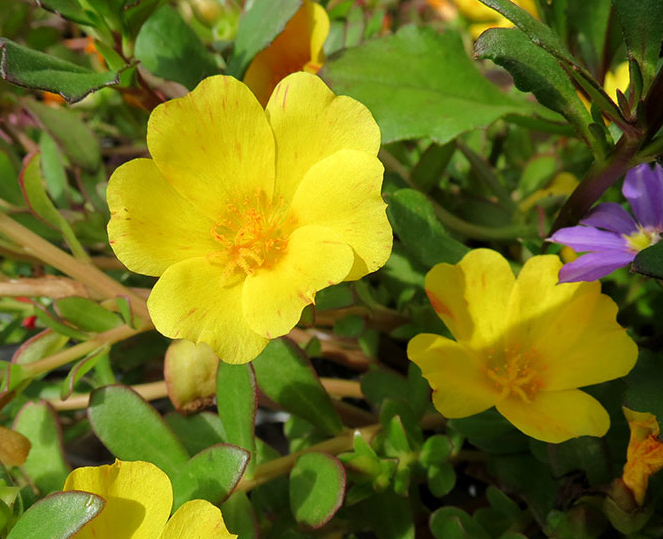 Pregnant women are normally recommended to avoid eating purslane as this emmenagogue food encourages uterine contractions and may therefore cause miscarriage. Calories 9 Kcal. Calories from Fat 1.35 Kcal. Calories 21 Kcal. Calories from Fat 1.98 Kcal.